Link Update (Again) and Bonus Link Trig! Once again, all my documentation permalinks got broken when Google Drive stopped supporting static URL hosting. But, I've transferred everything over to AWS now and gone through updating links accordingly on all the static project pages and a few select posts, especially this one. Hopefully these permalinks last a bit longer! Here's the full directory: https://scolton-www.s3.amazonaws.com/list.html. I may transfer more stuff over to there as I go, including maybe using it for hosting new static project pages. Still learning my way around AWS. The value x ranges from 0 to 1 as θ1 and θ2 both sweep from 0º to 90º, albeit on different trajectories. It makes an excellent feedback variable for the controller, since it can be derived from a simple weighted average of the two linkage angle sensors (after trig and exponent). And conveniently, x = 0.5 is where the wheel sets are perpendicular, for omni mode. For the link lengths used on Twitch X (L1 = 1.00in, L3 = 7.50in), I experimentally derived K = 1.23456789...no joke. But I wasn't ever convinced this was an exact solution, and as it turns out it isn't. This one's a lot less convenient from a control standpoint: since θ1 and θ2 are on both sides of the equation it's not obvious what to do with the wheels based on measurements of the linkage angles, at least not without further math. But this is the geometrically accurate solution. 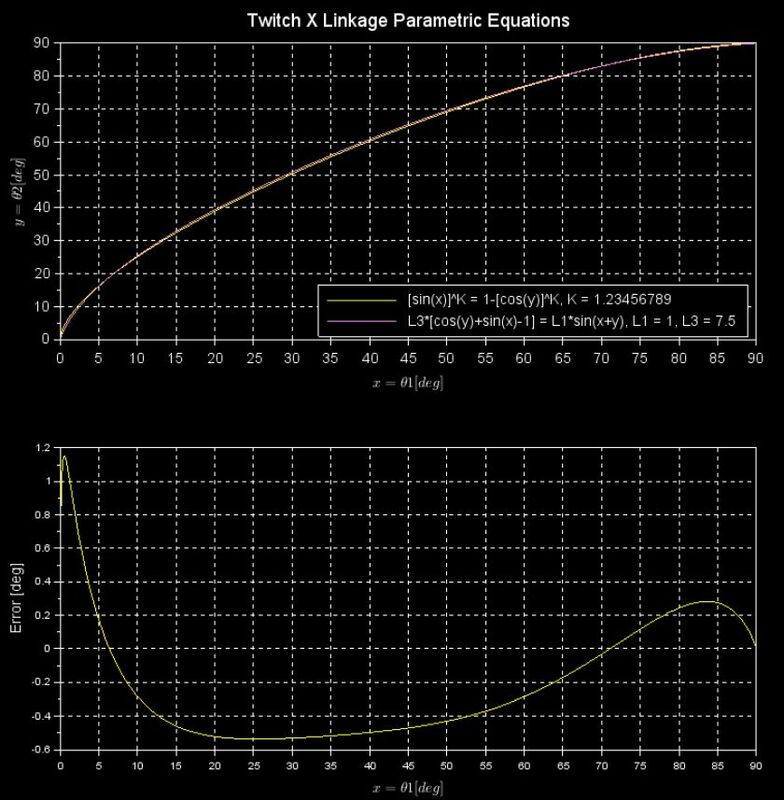 None of this matters as far as Twitch X control software is concerned - the exponential approximation with θ1 and θ2 separated is still far better for the application. But solving the mystery of the sin/cos link was really interesting.